Personal attention and the wholesome South African cooking adds to making your stay unforgettable. Three Tree Hill Lodge is a historic lodge in a secluded environment, created by Andrew Ardington and David and Nicky Rattray. This impressive lodge has a superb location and has the majestic Drakensberg Mountains as its backdrop. 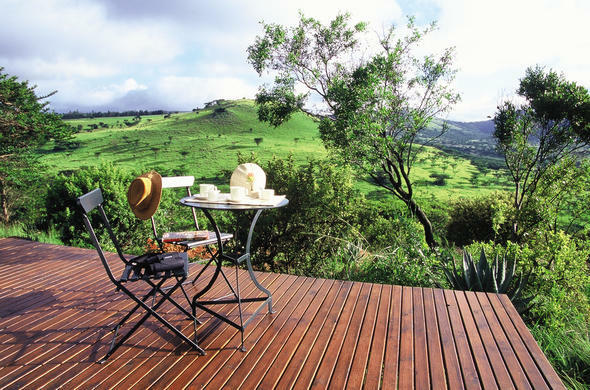 Individual colonial style 'wood and iron' rooms with outstanding views, even from the bath, overlook the Spioenkop Nature Reserve and Spioenkop Battlefield. Three Tree Hill Lodge has a viewing deck, from which White Rhino and Giraffe are often spotted, as well as a refreshing pool. Guests may enjoy walks on the walking trails, delicious meals and browse through the lodge's library. Look for souvenirs at the craft shop or explore the history of the Anglo-Boer War. Andrew Ardington, together with legendary Anglo-Zulu war historian David Rattray, has created this secluded lodge where the stories of the Anglo-Boer war unfold. Learning about Spioenkop, the bloodiest battle of the war, is the focus. Andrew, whose grandfather took part in the siege of Ladysmith, takes guests on a guided tour of the battlefield and brings to life the events of 24 January 1900.